The Incredible Gifts of Reuben V.
I stumbled across Reuben on November 11th, 2001. I had gone with a friend to view a dog he had seen advertised in the paper. I was there to assist in helping him not make any insane decisions like coming home with three dogs. Instead I came home with a dog I had not planned for. All sense of reason and practicality went out the window when I bent down and looked at the friendly little 12 week old puppy who looked me straight in the eye. “Oh Reuben” I said. His name issued forth from nowhere, unplanned, unrehearsed and never before thought of. It was just delivered from me to him as if it had always been that way. I looked at my friend and said you need to take both dogs because even in that moment I knew I couldn’t leave him behind. He said no so I had to quickly re-arrange in my head what my life would look like with this little guy in it. I had no idea how I would manage. I worked full time, travelled all the time, didn’t have a pet friendly apartment, was active in sports and had a robust social life. As we drove away with two little dogs named Reuben and Louis – ostensibly brothers, I wondered exactly how I was going to manage. I felt like I had taken that little dog and jumped off a cliff. But you know what, it all came together. And I realize now that it always comes together no matter how many cliffs you jump off of. All it does is mix up your life in a better and new way. At the time I worked at Raincoast Books and they allowed me to bring my new puppy to work for about 3 months. My friend took care of him until I found a new animal friendly place and as luck would have it we ended up right across the street from two good friends – just a coincidence but a great one. My friend Mark kept Reuben with Louis until all this came together. My life changed from focusing outwards to focusing inwards. I still socialized but now people came to my new place, those who knew me well, knew there weren’t too many places I would go without Reub. For two years I loved a dog who a lot of times wasn’t always that well. He was a big, robust looking dog with a fragile constitution – and maybe that early sickness changed his personality or maybe that is just who he was, but he wasn’t like other dogs. He wanted to please so practically no training was ever needed. If I said ‘sit’ to him three times he sat, if I practiced ‘stay’ twice, he stayed. He liked other dogs but he preferred me. 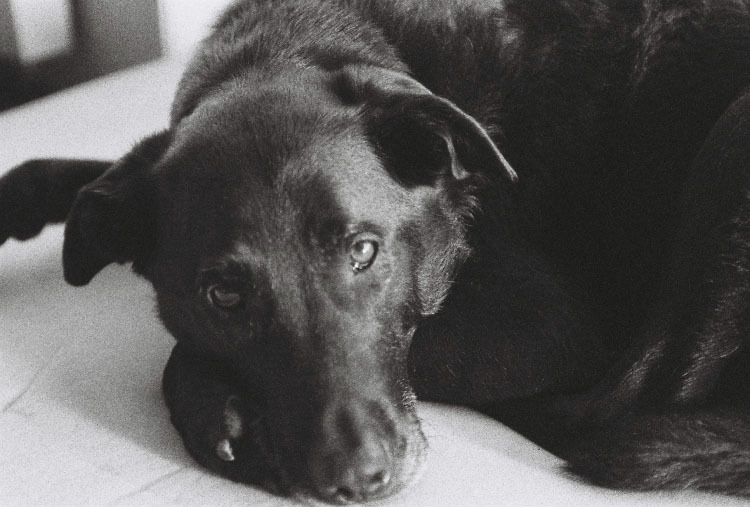 He was a mellow, soulful, smart dog. I didn’t think there could be anyone out there who could love that dog more than me. And then I met Dave. For the first long while Reub wanted nothing to do with him. Dave would take him for a run (which Reub actually hated to do) and he would run for 5 minutes and then make a mad dash for the car. When he was at home with Reub, Reub would look out the window for hours on end until I came home. About 2 years after we had met I came home and I noticed Reuben wasn’t in the window looking out for me. Dave looked at me and said “Me and Reub have been adventuring!”. I looked at Dave and thought to myself ‘adventuring’? Surely you jest. But then I started to see the games and little adventures Dave would take Reuben on and slowly but surely they developed a bond that was equally as important as mine. Dave protected him outside where they adventured and he taught him how to play. I protected him inside and loved him to death. And that’s how for the last nine years we formed a family and a bond between the three of us. Every where we went, he went. We giggled yesterday, even in our grief, about how we would arrive at dinner parties with Reuben’s bed (super comfy) pillow and blankets and party favours in hand. Throughout his life Reub had health issues. I’m not sure why but he just did. But the second gift I received from my relationship with this small family was watching how Dave dealt with Reuben on a daily basis. When it came to Reub’s health he left no stone unturned – he took risks if he thought we could prolong his life if there was quality of life to be had. When Reub was 5 he went through 4 serious surgeries. With each surgery his risk for survival decreased. By the last surgery we were at 10 percent risk of survival. I looked at Dave and he said “I can’t live with myself if we don’t go for it.” We always said we’d be happy if we got another month with him. We jumped off that cliff and we had another 6 amazing years with him. When Reuben had his last and most recent surgery and we were assured his quality of life would be good afterwards, again we went for it. His quality of life was great up until 2 days before he died and we had earned ourselves another month and a half of pure joy. From the moment Reuben couldn’t go with his dog walking group any more, Dave took him with him to work and off the two would go each and every day unless we dropped him off at his beloved nana’s. I would sit at my desk at work and every day I would get cute pictures of their daily adventures. Taking risks and unconditional love. Those are two things I learned watching Dave and Reub. That initial ‘jumping off the cliff’ as I like to call it, seems like nothing now when I’ve had the benefit of years of extraordinary, beautiful, rich life with an extraordinary animal and a man who has taught me about family and unconditional love. I want to acknowledge all the kindnesses that have come our way as a result of having Reuben, from extraordinary vets (Dr. Galloway, Canada West, West 4th animal emergency) to Dave’s mom who has always been our saviour and one of three people Reuben loved, to friends and dog loving friends who have been supportive and loving and who show me over and over again what it is to be generous. This is a little gift one of our dog loving friends sent – and I loved it. When I am surrounded by the night sky I’ll know that Reuben is close and I’ll be thankful for the beautiful gracious gifts he bestowed on me again and again during the 11 short years we had together. He was a lovely, sensitive, communicative fellow with a wicked tail wag. He miraculously survived all of those challenges and surgeries so that he could stay with you… his angels. Thanks for sharing this lovely tribute to Reuben Tess… Ruben was amazing, we all loved him and he will be missed dearly. Ruben had an wonderful journey with you and Dave. You are all in my thoughts and prayers. hugs…..
so beautiful Tessa. Just an amazingly touching & loving post. so sorry your lost your dear Reub, but so glad you had those years with him. while the loss is so difficult, the love and memories will last all your days. Thanks Nicole. Our life is definitely different without him. It’s still hard to get used to. We took that guy with us everywhere. Such a sweetheart.